If you believe everything you've read about eucalyptus recently, you might think you could spot a grove a mile away either by the flocks of healthy raptors circling above its canopy or the toxic groundwater flowing from its roots and the wafting stench of corpses crushed by fallen tree limbs. UNHARVESTED CROP : Telling the difference between agricultural eucalyptus and a wild grove is as simple as noting the alignment of the trees themselves. This field of blue gums is part of a greater plantation that once dominated large sections of the state park now known as Montana de Oro. # The issue of what to do with California's most conspicuous non-native plants frequently inspires passion from people who love and those who detest the giants, and public understanding suffers as a result. Even a cursory review of this topic uncovers the colossal depth of the problem how greatly the pitfalls associated with a hasty solution continue to tax the minds of ecologists. Yet, it's hard to find someone with a strong opinion on the matter neither chained to a trunk nor busy gassing up the chainsaw. Perhaps it's no small wonder that like a limp canary in a noxious coalmine a site-specific controversy over eucalyptus often precedes a greater one over development. "The issue is complex enough that people can use it to push their agenda," botanist and Cal Poly Conservatory director Matt Ritter commented. Recent months have seen a rise in eucalyptus discussions on the Central Coast particularly in response to State Parks' policy of clearing groves for native plant restoration projects. In an attempt to clear the public forest of pseudo-science, we've shelved the activists and asked the experts what the Golden State's greatest immigrants mean to its past, present, and future. Every Californian knows the abridged tale of the eucalyptus explosion one involving depleted state forests, a massive turn-of-the-century timber scare, and a miracle solution that ultimately never delivered. While CSU-Stanislaus historian Robert Santos said that's true in simple terms, the full story can't be told without mention of a pair of unlikely botanical hustlers. SMALL BEGINNINGS : The greenhouse of Cal Polys bio department houses a massive cross-section of flowering plants, including the smallest on earth and the largest (eucalyptus). 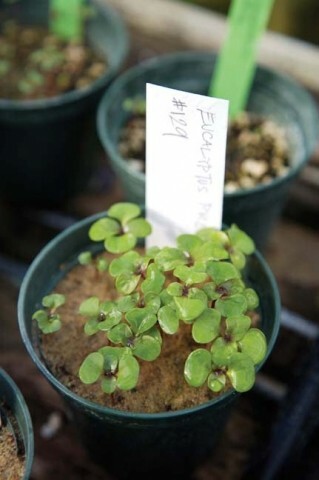 With luck, these tiny saplings could grow in excess of 200 feet. # Eucalyptus remained a mere garden oddity in the state until Ellwood Cooper a Santa Barbara educator noted its rapid growth in the 1870s and began stumping for proliferation as a solution to waning forests. Decades later, as industrialists eyed a hungry timber market, Cooper prote ge and State Forester George Lull predicted that the eucalyptus would soon eclipse the orange in agricultural value. So overreaching was Lull's statement that the industry never came remotely close to cashing in on the hype. Santos documented contemporary concerns that the speculation would invite "wildcat investments throwing the industry into a whirlwind of gluttonous activity." When an eventual bust vindicated the critics, it also fueled the contrary misconception that eucalyptus trees bear no industrial or agricultural value. Part of the problem could be traced back to Cooper's preference for the fast-growing blue gum, rather than more robust species. An ignorance of the logging infrastructure in place at the time designed to process more dense oak and redwood also spelled the demise of the short-lived industry. ONLY PERCH IN TOWN? 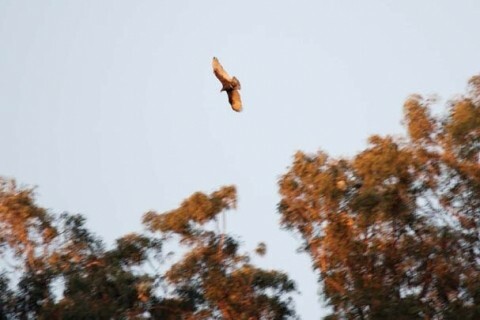 : The planting of eucalyptus ushered in a very definite species shift in some local state parks that favored larger raptor species. What remains to be seen through research is where the birds would go without the canopy. # cutting tactics of the local State Parks office, the wildlife professional didn't cry too much when a statewide training seminar in Oregon kept him from participating in a Sierra Club eucalyptus summit in San Luis Obispo on Jan. 26. "It's a difficult situation because it's such an emotional issue," Cicero said. "If you look at the General Plan, it's not like we're going to take down the forest." For Cicero, his agency's stewardship over one of the most unique floral ecosystems on the planet the native maritime chaparral of Montana de Oro amplifies the problem significantly. Concerns with raptor habitat must strike a balance with the defense of these scrub strongholds that are, in some cases, found in few other places on earth. Once draped along the California coast, dune habitat continues to wane with urban sprawl. Maritime chaparral ranks among the richest coastal scrub in the sheer number of federally listed dependants. But does this signal a massive euc-slashing effort at the heralded park? Hardly, Cicero said. "There are a lot of elements to consider, and sometimes the issues are not that straightforward," he explained. Today, for eucalyptus management policy in Montana de Oro, containment remains the name of the game. In recent years, fear of litigation has prompted several communities to prune, spot remove, and even clear eucalyptus. The paranoia climaxed with the Bay Area bedroom community of Los Altos drafting a citywide ban in 2006. The move came after falling branches killed a cyclist during a winter storm that downed power lines. Professors Alison Berry of UC Davis and Larry Costello of the UC-Extension launched a program in the '90s to database urban tree failures now perhaps the largest on earth. The California Tree Failure Report Program reported that, as of Jan. 17, 2007, eucalyptus account for 13 percent of documented failures in urban forests statewide. However, the researchers associated with the failure project hastened to discourage generalizations about the genus as a whole. Dr. Berry partly attributed the greater number of failures which places the tree group third on the overall list to a frequently overlooked fact: the sheer number of eucalyptus in California. "Part of the reason we studied it is because there are so many of them planted," she said. "There are more examples for potential failure." On a more threatening note, flammable oils exuded by many eucalyptus species constitute a definite urban fire hazard though much natural California vegetation often shares that perilous trait. Some oily native scrub found around Santa Margarita proves downright explosive and, as ranchers often complain, is more difficult to control. No petiole-wafting tree-hugger could ever silence the bulldozers with such ruthless effectiveness as could the mere presence of the endangered Morro shoulder band snail or the red-legged frog. Not far down the protection gamut and way more visible is the monarch butterfly, which claims winter dominion over these shores and often roosts in the shelter of eucalyptus groves. In fact, Dr. Dennis Frey the Central Coast's resident butterfly specialist reported that, of the more than 40 established monarch camps in the region, all but "one or two" exist in eucalyptus-dominated habitat. His statewide analysis with Dr. Andrew Schaffner determined that this trend holds true for roughly 75 percent of documented monarch roosting sites in California. With such overwhelming statistics, it's easy to armchair correlate eucs to monarch survival, but Frey cautions against such rationale. "The removal of most eucalyptus groves would, I'm sure, have no impact on the monarch," he said. According to state databases, very few roosting sites are found more than two miles inland and, even in the coastal zone, monarchs prove incredibly fickle. Several years ago, Frey witnessed 75,000 butterflies occupying a grove near Hazards Canyon in Montana de Oro. Today, the grove sits vacant, with no scientific explanations as to why. 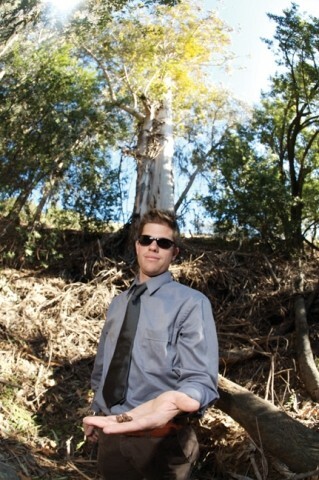 ARBOREAL : Ecologist Matt Ritter of Cal Poly studies the germination of eucalyptus species. He compiled a short list of genus members with the proven ability to reproduce in California. The mammoth Karri eucalyptus specimen behind him is not one. # experts challenge one keynote argument used in the implementation of this mandate: that eucalyptus groves exhibit starkly inferior plant diversity than does surrounding habitat. The point is irrefutable, countered Cal Poly ecologist Ritter, but the assertion is something like comparing apples to orange day lilies. "Would you expect to find diversity in a cornfield?" Ritter asked, going on to explain that most of the euc planting in California occurred in a structured agricultural manner after the land was already purged of native vegetation. A guided tour through a creekside grove in Poly Canyon revealed a desolate forest floor, with little thriving in the shadow of the densely planted giants except traces of poison oak. Yet, amid one patch of blue gum towered a monstrous 200-some-foot white-trunked diversicolor eucalyptus sometimes called Karri in Australia with leaves shimmering green and gold. Across the state, you can find specimens of literally hundreds of species within the greater eucalyptus genus some as rare and spectacular as the Poly leviathan. "I'm into protecting endangered species," Ritter said, "not just the native ones." Eucalyptus trees are tall, and they flower. In fact, they're the largest flowering genus on the planet. This simple fact breeds a sense of endearment for countless residents and makes pitching eucalyptus-management programs incredibly difficult. According to State Parks' Cicero, replacing eucalyptus with native scrub requires significant resources including conducting pre-cut research, readapting the land for native growth, and monitoring to prevent foreign weeds from choking the new seedlings. INFIDELS! : "It is a very serious problem actually that is an understatement," a local ecologist said of widespread African veldt grass infestation in the coastal dunes habitat. This aggressive and invasive clump weed will try to choke out freshly planted native scrub once the eucalyptus is removed in a restoration effort. # The budget permits little space for extensive PR campaigns, which leaves public understanding to be forged in the heat of development debate. In October, the San Luis Obispo Coast district of State Parks caused bad vibrations among many Los Osos residents by allowing developer Jeff Edwards to remove a patch of 396 blue gums around a construction project near Montana de Oro. Cicero reported that the restoration effort is going well. The catalog of information about eucalyptus' role in the California ecosystem, briefly cultured in this report, already occupies volumes, as the mysterious family of trees continues to harbor a bevy of secrets. When scientific research dictates the feasibility of a proposed restoration program, articulating the move to a public inundated with decades of sketchy information proves to be a major challenge. Parks department officials literally hold seminars to deal with this dilemma. "We haven't been very successful," local State Parks district superintendent Nick Franco lamented. "The problems that we face are the universal blanket statements people make about eucalyptus. That's where you end up with the conflict." However, even those versed in the controversial plant disagree with officials from time to time. Experts who challenge restoration policy generally don't rustle leaves so much at the motive behind the projects, but rather the projects' execution. 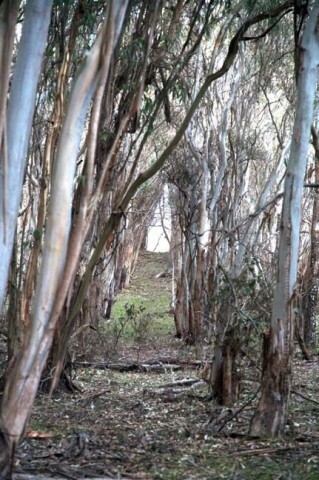 In Montana de Oro, where eucalyptus encroachment has halted for decades at least, Cal Poly's Ritter questioned the batch removal of trees as the best route to protecting native flora. The botanist fears that clearing entire groves could trigger the further proliferation of the more invasive and aggressive clump weed known as African Veldt grass. 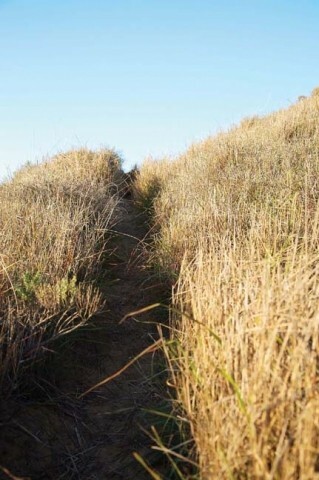 Ranchers long ago introduced the insidious plant for feed and dune stabilization. It promptly took over. Concerns over potentially homeless raptors and dispossessed invertebrates also make a strong case for throttled-back restoration programs, especially considering the extremely incomplete picture of native life before European meddling. "It would be hard to go to any euc-dominated monarch roosting area and safely do any wholesale species removal," butterfly specialist Frey said. Ritter suggested thinning existing groves just enough to allow an understory of native scrub. This alternative model compromises State Parks' stated vision of recreating verbatim the native coastal ecosystem, but it also provides something revolutionary: options for an exit strategy. Staff Writer Patrick M. Klemz demands an exit strategy before planting eucs in Tehran, though he would really rather garden at home. To trade tips on healthy soil, contact him at pklemz@newtimesslo.com.